Indulge with the tempting Magnum range – combining thick, cracking Belgian chocolate and smooth delicious ice cream made with the finest ingredients. 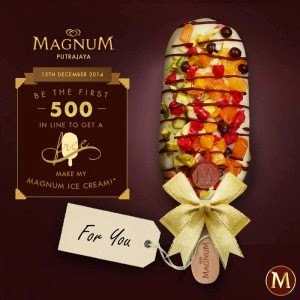 We offer a wide range of choices that includes the original, pinnacle of pleasure Magnum Classic as well as the chunky Almond, the smooth, creamy Brownie, delicious Strawberry and many others. For a mini moment of indulgence Magnum Mini range is just perfect for an after-dinner me-time treat. The pleasure is yours for the taking. Be the 1st Lucky first 500 in line on 15 December 2014, 10 am onwards.